Justin Paquin of Paquin Entertainment reported to UMSU council on Monday, Oct. 21 that the Frosh Music Festival generated a net loss of $150,404. Paquin entertainment was contracted by the UMSU executive to organize the Frosh Festival. Justin Paquin served as production manager for the event. According to Paquin, the unanticipated loss was a result of headliner Childish Gambino’s last-minute cancellation for the Friday showtime. Lower-than-expected alcohol revenues further compounded losses after the festival switched to a two-day format to accommodate the rapper. Following Paquin’s presentation, UMSU vice-president internal Amanda McMullin shared the union’s 2013 to-date finance report, where she outlined the union’s attempts to counter the Frosh deficit. McMullin explained that UMSU has saved $10,500 in personnel costs, as well as $140,000 on the union’s new Health and Dental Plan, which, according to McMullin, works out to $10 in savings per University of Manitoba student. Councilor Steven Stairs nevertheless expressed frustration at how the Frosh Festival was re-organized following Gambino’s unexpected ultimatum. “There were critical points during this process where there could have been consultation, and there could have been outside information brought toward council concerning appropriate means of going forward, and regarding how we’re spending our money,” said Stairs to council during a question period. UMSU’s council’s ad hoc CFS review committee, which was struck earlier this year, will hold its first meeting later this week. The meeting will be closed to all but committee members. 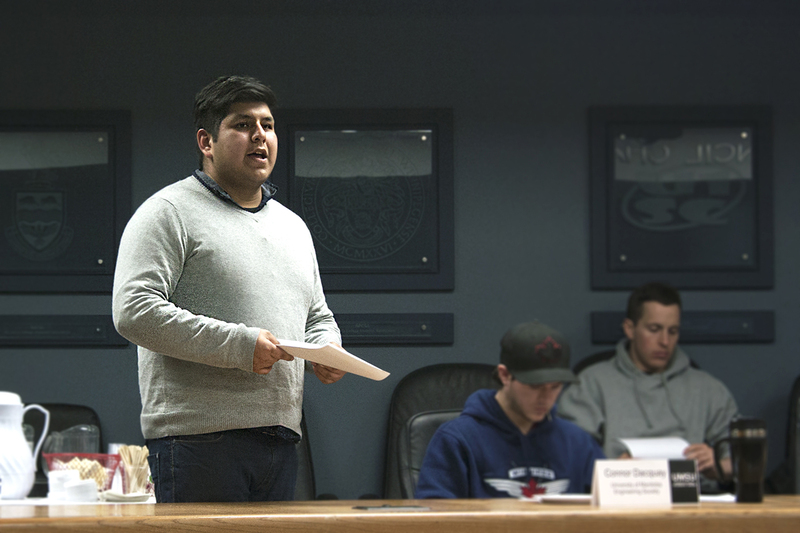 Two more UMSU councilors are still being sought to fill vacancies. 2 Comments on "UMSU council briefs"
That gambino was so childish.